The combination of the horse and monkey forms the rebus Ma shang feng hou, an auspicious wish for a speedy promotion to higher office. 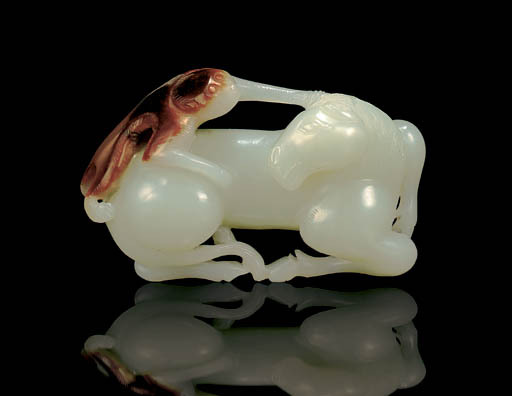 As such, the subject-matter was a popular one for its symbolic meaning and charming portrayal, and thus, proliferated throughout jades carved in later periods. This group is delightfully conceived, with the monkey gently reaching for the horse's ear, and the horse with head slightly bowed, to allow the monkey's touch. The elongated shape of the horse's body and head compare closely with that of the Brundage horse in the Asian Art Museum, San Francisco, which is attributed to the sixteenth century; cf. James Watt, Chinese Jades from Han to Ch'ing, New York, 1980, p. 84, no. 67.